The Education 2030 agenda has placed learning outcome indicators at the core of its monitoring framework. That change from the earlier MDG agenda is most evident in target 4.1, where the global indicator is a measure of proficiency in reading and mathematics at three different ages. There is as yet no global standard for proficiency, although steps have been taken towards establishing one in recent months by the UNESCO Institute for Statistics. 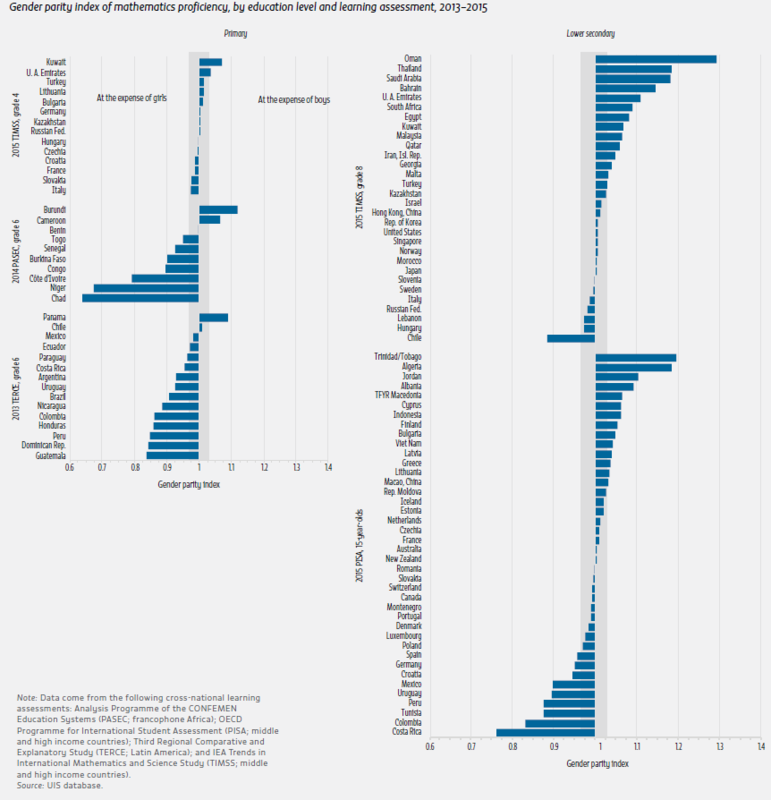 Currently, the SDG database includes minimum proficiency achievement data from regional or international learning assessments whose benchmarks may not be comparable. Available data suggest that, in many countries, students do not reach the minimum proficiency level set by the assessments. This is particularly the case in low and middle income countries, which are already under-represented in the SDG database. Gender disparity in learning outcomes emerges in diverse patterns among subjects and over time. In the case of mathematics, girls show a clear disadvantage in the upper primary school grades in Latin America and in sub-Saharan Africa. Only two girls for every three boys reached minimum proficiency in grade 6 in Chad and Niger in 2014, without even taking into account the considerable gender disparity in primary completion rates. In 2013, about 85 girls for every 100 boys in grade 6 achieved minimum proficiency in Colombia, the Dominican Republic and Peru (Figure 6). At the lower secondary level, for a different set of countries and learning assessments, more countries were closer to parity in mathematics. 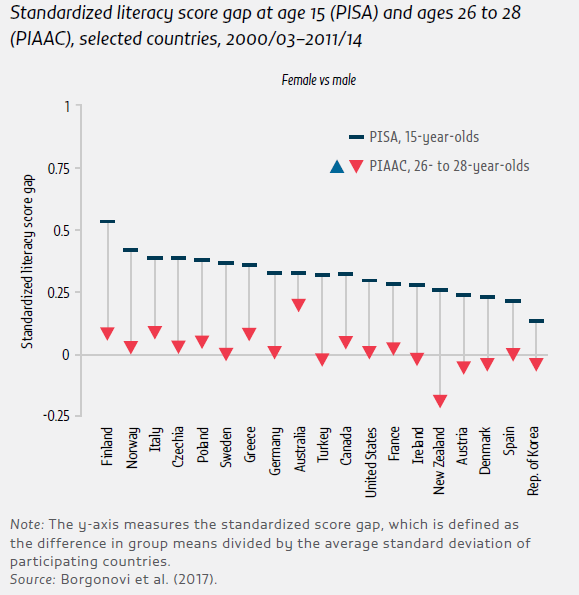 Of 20 countries observed at the end of both primary and lower secondary education, all remained in parity, on average, except for Costa Rica. Girls’ advantage in reading is well documented. All countries whose learning assessment results at the end of lower secondary education are posted on the SDG database had a gender disparity at the expense of boys. In Algeria and Jordan, which took part in the 2015 PISA, only 53 and 54 boys respectively achieved the minimum proficiency level for every 100 girls. In European Union countries that took part in the same survey, the smallest gap was in Germany (93 males for every 100 females) and the largest gap in Cyprus (70 males for every 100 females). However, new evidence casts doubt on the real meaning of this gap (Box 1). The wide gender disparity in student reading achievement is a striking finding of cross-national learning assessments: the large gap favouring females has been seen as cause for concern. But learning disparity changes over young adulthood. Young people’s literacy and numeracy skills continue to develop after compulsory education, reaching a peak at around 30 years old. The ways in which skills develop are influenced by the many formative education and employment choices and paths young people pursue. The results may be more complicated than the accepted narrative suggests. A comparison of cohorts that participated in a PISA survey at age 15 and in the Programme for the International Assessment of Adult Competencies (PIAAC) survey 12 years later showed unexpected changes in disparities. Wide literacy gaps between girls and boys narrowed or disappeared in young adulthood. At age 15, girls in Organization for Economic Co-operation and Development (OECD) countries outperformed boys in reading. By age 27, the gender gap had almost completely closed, with gains concentrated among low-performing males (Figure 7). One possible explanation is a difference in how males engage with the PISA and PIAAC assessments. PIAAC’s shorter duration, use of technology and use of a trained interviewer in the home may elicit greater male engagement than the PISA assessment, which is administered in schools and in which peer effects may be present. This hypothesis is supported by the already very low gender disparity in literacy found in PIAAC assessments of those aged 16 years. By contrast, there is no doubt about the persistent gender gaps in adult literacy rates as traditionally estimated, mainly through self-reporting in population censuses. This gap changes only slowly because of the past legacy of limited education opportunities for women. While the adult literacy rate increased from 81.5% to 86% worldwide between 2000 and 2015, the share of women in the total population of adult illiterates has remained constant at 63%.  The share of women in the total population of youth illiterates stands at 57%. 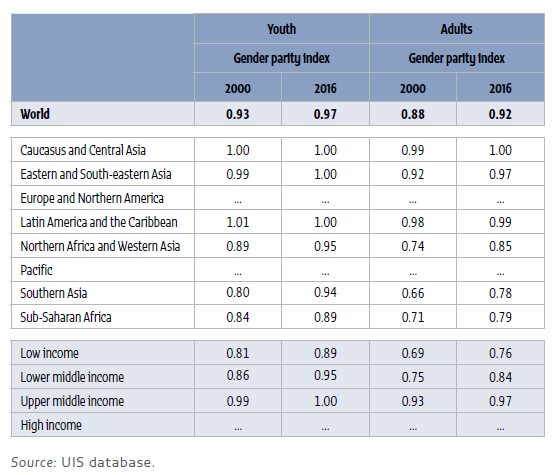 Gender disparity persists in the youth literacy rate in three regions: North Africa and Western Asia, Southern Asia and sub-Saharan Africa (Table 5). Target 4.4 focuses on skills for employment, decent jobs and entrepreneurship, a measure that covers a wide scope. The 2016 Global Education Monitoring Report outlined a range of skills that could be included here, but it emphasized that skill requirements were specific to job opportunities, which differ by country. Given the task of identifying skills that (a) are relevant across diverse labour market contexts, (b) are acquired through education and training, and (c) can be measured in a meaningful way at low cost, the SDG monitoring framework has focused on ICT and digital literacy skills. 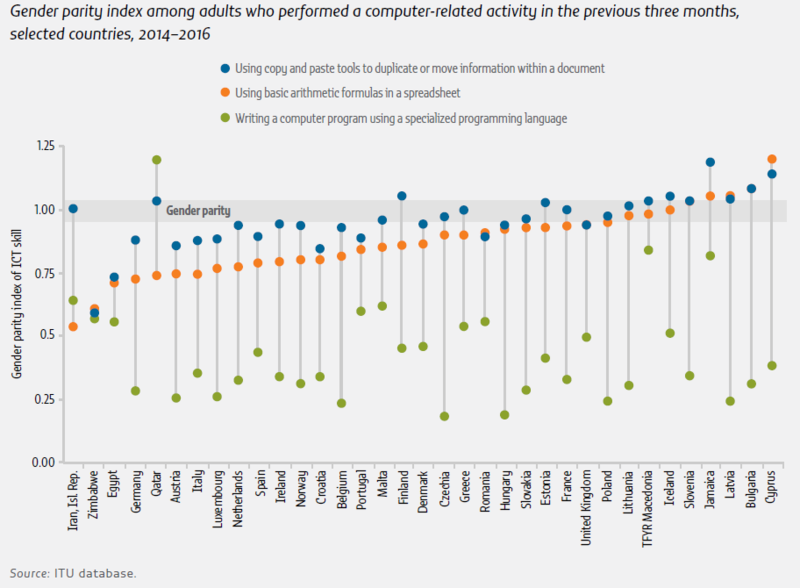 The global indicator of ICT skills – the percentage of individuals who, on a standard household survey or census, report performing any of nine computer-related activities in the previous three months – is an example of an indirectly assessed measure.1 Analysis of the International Telecommunications Union (ITU) survey database for 2014–2016 showed that most adults in low and middle income countries could not perform even the most basic ICT functions. Only 4% of adults in Sudan and Zimbabwe could copy and paste files, and only 2% to 4% of adults in Egypt, the Islamic Republic of Iran, Jamaica and Pakistan could use basic arithmetic formulas in a spreadsheet.  There is considerable inequality in the distribution of these skills. The gender parity index of programming skills in European countries including Austria, the Czech Republic and Hungary is extremely low: at most, 25 women for every 100 men can program. Few countries achieve parity even in less sophisticated skills: about 75 women for every 100 men could use basic arithmetic formulas in a spreadsheet in Italy, Germany and the Netherlands (Figure 8).